Refugee camp of Azaz, Syrian border. Refugees from Halep and surrounding areas have lost their houses under the bombings. They left Halep with just the clothes they had at the time. They have no documents, no money, no belongings. The refugees believed the could cross the Turkish border to escape the massacres, but after a limited number of refugees were accepted by the Turkish government who settled in the nearby camp of Kilis, the border was closed. They had to settle in the camp right on the Syrian border, waiting for a move that does not arrive. Turkey cannot take more refugees and cannot do more than what actually it does. The refugees must stay were they are, with no home in Syria anymore, no passport to leave the country, as if convicted to stay in the camp. The excess number refugees not accepted into Turkey settled in September 2012 under big hangars once used by Syrian customs police for storing and checking goods before letting them pass the border. For months the refugees had to sleep right on the pavement, under hangars, under trucks or any other shelter available. No heating, no running water, no latrines, no roof above their heads. Tents arrived just at around the middle of November 2012, donated by the Red Crescent of Qatar. Since that, three hangars were filled with tents, then other tents were placed on open ground. 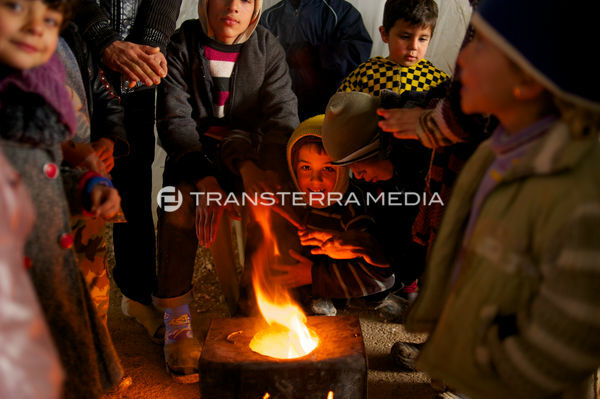 In December 2012, the number of refugees at the Azaz camp reached about 7000. Life at the camp is hard. Volunteers from various ONG such as IHH provide meals every day. Supplies come from world wide relief organizations and volunteer donations, but they are not enough to meet the needs of so many. Tents are not waterproof. The pavement is constantly wet when the rain falls, especially hard for those ones settled on open ground. No electricity is supplied. Water is scarce and is brought in big containers for those who need it most. Heating becomes a real issue with the oncoming winter. Kids are sent to the surrounding fields to gather any burning material, but they cannot go too far since the mine fields protecting the no-man’s land are right at border line next to the camp. Refugees burn dry grass. At dusk, they must make return to their tents, because all around there is no light to even walk. They rest by candlelight in their tents until they fall asleep. Recently a protest calling for better conditions at the camp was held at the border (see other reportage “Syria - protest in the camp of Azaz”, © Michele Pero) to get attention from the Turkish Governor of the area, with no results. These people must stay here. No place where to go, no place to return to. Convicted, forgotten. No one knows for how long.